The VisAD Library is a powerful and comprehensive software development package for working with scientific data. 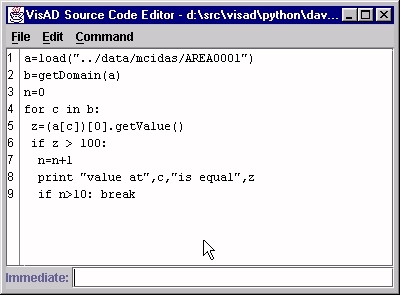 While substantial applications can be built by professional software developers, scientists and others may find it easier to write VisAD applications in Python. 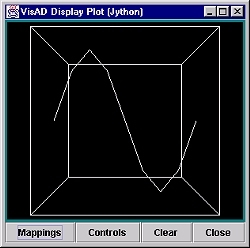 The Jython (Java-based implementation of Python) interface to VisAD is being developed to provide this friendly environment. Dynamic compilation to Java bytecodes - leads to highest possible performance without sacrificing interactivity. Ability to extend existing Java classes in Jython - allows effective use of abstract classes. Bean Properties - make use of Java packages much easier. Python Language - combines remarkable power with very clear syntax. It also supports a full object-oriented programming model which makes it a natural fit for Java's OO design. several batch files for starting Jython and VisAD (links to which will be put into the Start->Programs->VisAD menu item). Download this file and run it. You will be prompted through the installation, and given some options about what directory to put the files into, and where to put the icons for the short-cuts (for launching the interactive command prompts, the VisAD-Jython Editor, and the VisAD Spreadsheet). After the install, click on the "Jython Command Window" short-cut icon first; this will allow the Jython environment to set up correctly - you will see several messages about analyzing packages before you get the familiar ">>>" prompt. The analysis only happens once (or when one of the jar files changes). Note that if you use this method to install the Java Runtime Environment, no system configuration changes will be made (to your PATH, or Registry). In the following descriptions, if you need to run the java command, you will have to give an explicit PATH something like: c:\myinstalldir\jre\bin\java -mx256m ..... Or, you can add this directory to your PATH. If you are running Linux on an Intel machine, there is also a quick-install gzipped-tar file available. Download this file and then gunzip/untar it -- it will create a jython directory an put all the files there (including the Java runtime, Java3D, visad.jar, jython.jar, and several startup scripts for you). Otherwise, if you are not using one of those two OS/environments, then you'll need to install at least Java and Java3D first - see the VisAD Homepage for details. For other Unix systems, you can just use your installed Java and Java3D along with the tar.gz file above - which contains VisAD and Jython. You may need to edit the startup scripts (although we've tried to code them to avoid that). If you cannot use the tar.gz file above, then you'll have to also get VisAD (the visad.jar file) and Jython. Once you install Jython, you will find a file in its home directory named registry -- this is where Jython keeps its environment information. (Note: this is not the "Windows Registry".) The file is editable and contains numerous examples and tips (imbedded as comments). Details can be found here. Why am I telling you this? Well, if you are going to create your own Python scripts and library routines, or you want to use the ones that come with VisAD without having to always run from the directory containing them, you will find it much more convenient to set the python.path value to include your directories. (or the equivalent in Windows). Believe me, this is an easy one to mis-type! What does this do? It causes Jython to look at the JPythonMethods class file and import all the static methods defined there-in. We have put many VisAD short-cuts there, and are continuing to define higher-level methods to provide for often used combinations of VisAD methods. Fortunately, the JPythonEditor automatically supplies the from visad.python.JPythonMethods import * for you! from visad import Real, FlatField, etc. Jython comes with an interactive, command-line interpreter. Keep in mind that, unlike the JPythonEditor, it does not allow you to build a script; rather, it allows you to enter Jython commands that are executed immediately. Now, what's happening? First off, the "from visad.python.JPythonMethods..." line causes the Jython interpreter to look at the class file "visad.python.JPythonMethods.class" and gather a list of all the method names contained therein. You may then pick a method from this list by simply using its name. plot() and field() are both methods (functions) in this file. To use these quick graphs, you must first import graph in your Jython script. This section gives you the details. You note from the trivial example in the last section that there are no explicit references in the code to anything that tells you that VisAD is underneath. It's all there, of course, but in this simple case, it is quite hidden away. The trick is in defining the right kind of methods to consolidate VisAD functions that are often used. You certainly can go "under the hood" if you want. For example, the variable "a" in the above example is really a VisAD "FlatField" object. You can use any FlatField method you want. Ugo Taddei has created an excellend tutorial on VisAD programming, which you can view at this link. Also, Frank Gibbons has translated Ugo's examples into Jython, which you can find here. In this section, we'll talk about the model of data that VisAD uses, and then introduce the built-in functions that operate on these data. Each sub-section will contain the details and examples, so just follow the links. Since the meaning of image2 - image1 is to "subtract one object from another", we treat this as meaning subtract the data values of one object from the other. The beauty of this is that the notation is simple; furthermore, as you'll learn, if these image files also have navigation information, any re-sampling that must be done in order to perform the subtraction will take place automatically. where 'x' is the value you are testing, and you have previously done an import java.lang.Double. This section shows you two basic ways to read data from files. The load() function reads several different types of data files into VisAD Data objects. The second method uses Jython's File I/O to read the data, and then must make VisAD Data objects. This section shows how to use the plot() function to quickly inspect your data. Later sections will show you how to build your own, specialized displays. In this section, we name all the math and trig functions, like cos() and abs(), that operate on VisAD Data objects. As discussed in the last section on the Data modem, operators in Jython apply to the entire object. Field construction functions When you have raw, binary numeric values and need to construct VisAD Data objects, this section shows you how. A general-purpose method called field() can help you create one and two-dimensional objects. 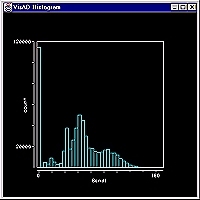 Histogram functions One common rearrangement of data is into a "histogram", where samples are collected together into "buckets". Data Type functions In this section, we describe several methods for extracting portions of the metadata from the data objects - for example, the sample set of the domain, or the units. Methods to rearrange and extract data This section describes a few methods to rearrange your data objects and to extract portions of them. This can be very important when you have data with multiple range components...for example, multi-spectral images that have more than one channel imbedded in the image file. Here the development of an application that presents two panels to the user - one has an image with a movable horizontal line; the other shows the the brightness values at points along that line. This example will be developed in stages, to give the opportunity to discuss trade-offs and ideas. In this section, we make some small modifications to the example from the previous section to illustrate how to make your application collaborative. Just click here to see how easy it is...and to see what is perhaps the smallest, useful VisAD application ever written!! We'll put your contributions in this section. To encourage you to share your .py scripts with others, I've put a seedling here. This script is actually just a set of helper methods that are used by the example in the previous section. Not sure what I want here, except it would be nice to have a two-way street for folks to share their stuff. Maybe a new visad-jython email list or something.